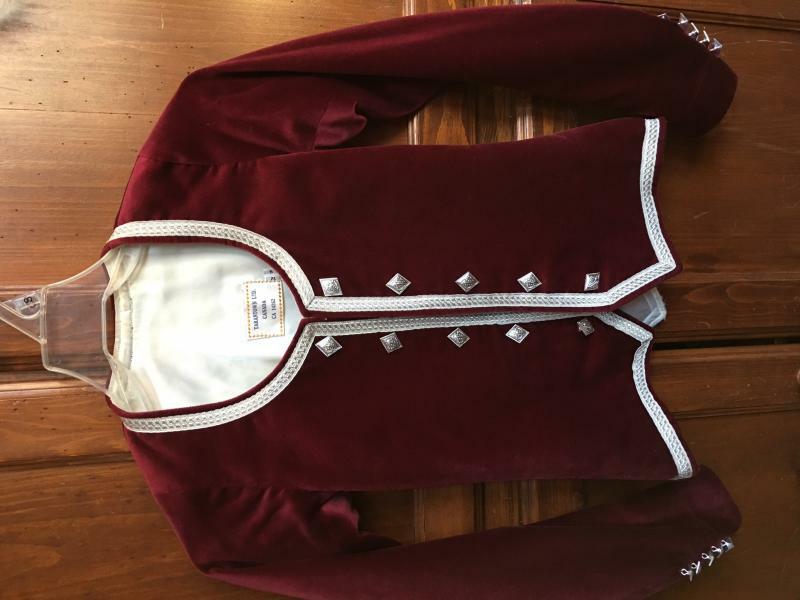 dance.net - Wine colored jacket (Tartantown 12 S) (10244299) - Read article: Ballet, Jazz, Modern, Hip Hop, Tap, Irish, Disco, Twirling, Cheer: Photos, Chat, Games, Jobs, Events! Wine jacket in very good condition. White lining has some fading/discolored areas, although jacket has been dry-cleaned. neck-to-point in back - 21"
shoulder-to-point in front - 20"
Just checking the measurements. The jacket length seems long for the other measurements. Was the dancer who wore this very tall? Yes that's all the way to bottom of the back point. As noted, width was taken in. If you look at Tartantown's 12S stock sizes, it's supposed to be 20.25, so maybe this one was a tiny bit long but close. Dancer was 13-14 years when this was worn, and maybe around 5"1' tall. Dancer was 13-14 years when this was worn, and maybe around 5" tall. Thank you for your response. Unfortunately, I think it will be too long for my dancer.